Award-winning researcher Phiala Shanahan is working in an area that’s both infinitesimally tiny and infinitely large. She’s trying to unravel the mysteries of protons and neutrons and even tinier subatomic particles such as gluons and quarks, which form the building blocks of our known universe. Phiala graduated from the University with a first class honours degree in High Performance Computational Physics in 2011 and has been impressing at the highest level since. She won the Alumni University Medal for both her honours degree and her PhD, and in July this year she was awarded the Bragg Gold Medal for the best Australian PhD in Physics in 2015. During her PhD Phiala studied the mysterious properties of quarks and gluons – the subatomic particles which make up the proton – and her insights are expected to lead to further work by other labs around the world. “Theoretical particle physics is a really exciting area with lots of puzzles still to solve,” says Phiala. 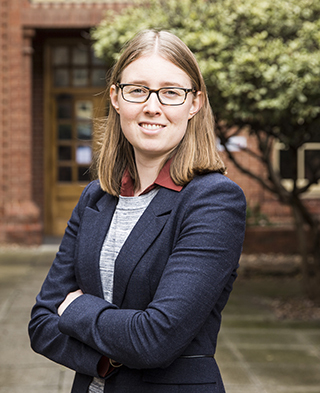 Phiala’s interest in theoretical nuclear physics was sparked by the work of various professors at the University of Adelaide. After completing her PhD she won a postdoctoral position at one of the world’s leading science universities, the Center for Theoretical Physics at the Massachusetts Institute of Technology in Boston. Her research there is taking two major directions – better understanding the way in which complex structures like atoms arise from fundamental particles, and the gluonic structure that binds quarks into protons. “I work mostly on pen-and-paper theory and do large-scale numerical simulations on supercomputers,” she says. Phiala is now hoping to use an electron-ion collider to measure various gluonic properties experimentally to compare with her theoretical predictions. She also intends to broaden her research further next year when she takes a faculty position at the College of William and Mary – a cutting-edge research university in Virginia. This will also give her access to the nearby Thomas Jefferson National Accelerator Facility, known as JLab. In September Phiala was back in South Australia when Adelaide hosted the 26th International Nuclear Physics Conference. “It’s a major international conference that attracts the whole nuclear physics community – experimentalists as well as theorists and computational people like me – so it was very exciting to have it in Adelaide,” says Phiala.